A bride to be (October 3, 2009) stopped by and shared her Upper Case Living site with us. Upper Case Living carries applique producs which are GREAT for weddings. They work well on virtually any surface, and are perfect for glass candle holders, aisle runners, mirrors, dance floors, or anything your imagination can dream up for wedding decor. 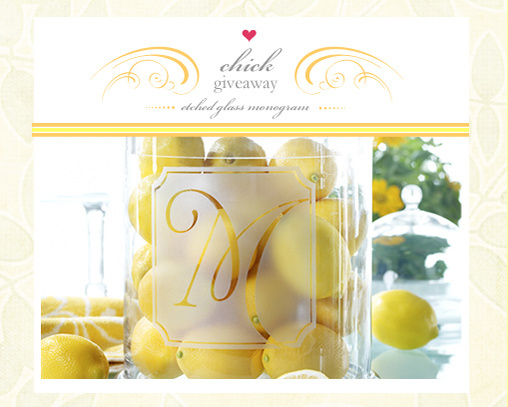 Kim was so gracious enough to sponsor a Chick Giveway for one of our lucky brides. An Etched Monogram that would add some extra decor to your special day. Plus it will be lovely to have afterwards as well. 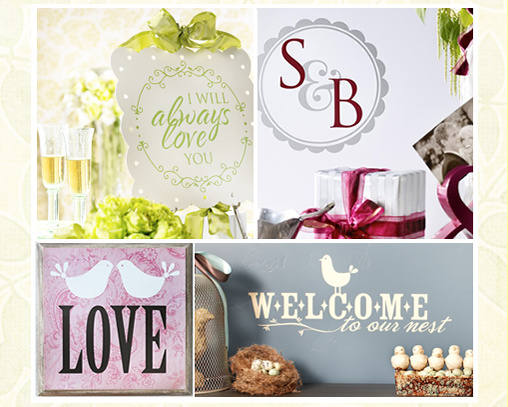 Simply leave a comment and let us know which Monogram would fit in with your decor and what you might use it for. A Winner will be chosen next Tuesday so be sure to check back. THANKS TO ALL THAT ENTERED THIS CONTEST IS CLOSED AND A WINNER HAS BEEN CHOOSEN.